Summer is right around the corner, and there is no better place to be than in Asheville! Make the most of your free time by enjoying all that the mountains have to offer. Kick off the celebrations at the Mountain Sports Festival over Memorial Day Weekend, right here in town at Carrier Park. Volunteer, race, partake in food, music and demonstrations. This family friendly event has something for everyone, and is free! When the days grow too hot to be outside, head north on the Blue Ridge Parkway for Mt. Mitchell State Park, where temperatures are on average 10 – 30 degrees cooler! It makes sense when you learn that this is the highest point east of the Mississippi, and it’s right in our backyard. Bring a layer and your raincoat, enjoy the 360 degree views, and pack a meal or bring food to grill at one of their many picnic sites. Access is free and offers hikes ranging from beginner to advanced. Locals know, avoid the crowds and hit this popular park on weekdays. What Goes into Creating a Strong Resume? We have all had experiences that are influential to our lives and who we have become. They range from the time you accepted your first part-time job working at Wendy’s to when a customer choked on a piece of cheese and you performed the Heimlich in the restaurant. Our experiences help us develop skills; skills that can demonstrate to employers that you are their ideal candidate to hire. But how do we show employers via a short resume all of the incredible, and sometimes weird, things we have learned? This model helps even the most lay reader truly understand all of the work you have done and why it is important. Basically, anyone can say they are calm under pressure, but saying “demonstrated a calm demeanor during hectic situations such as performing the Heimlich on a customer and ensured their safety afterwards” really pushes the point home! Ah, spring: Time for the start of a new semester, cold temperatures, and starting to think about summer plans: internships, part-time jobs, careers, oh my! But not to worry, the things you’re doing right now could be the key to helping you lock down those summer plans. If you’re a member of a club or organization, part of a sports club or team, working on campus, volunteering in your community, serving in a leadership capacity, or getting involved in any other way, you’re already halfway there. That involvement on campus is your golden ticket to the summer plans of your dream. Are you building your people-skills by engaging in teamwork? Do you hold a position or did you organize a large event or project in a way that would demonstrate leadership? Are you learning new technical skills such as financial management, computer skills, event planning experience, project management, fundraising, and more? Really think critically about what you are doing beyond just the obvious here. It’s easy to downplay what you’re actually doing and say something like “attended events and meetings”, but what were you learning and doing during those events? Ideally you were learning and practicing soft skills and contributing to the success of the organization. If not, get out there and make the most of your experience! Choosing a course of study can feel like a daunting task. It will dictate which classes you take, what internships and/or jobs you will be best suited for, your potential earning power, and what your day to day life could look like after you graduate…. Right? Wrong. It can only influence those pieces of your life. While choosing a major is an important decision and should be done with consideration, it is not a life sentence. It will not put you on an irrevocable path. I, for example, have a BA in Communication Studies, went on to be a field instructor for Outward Bound leading wilderness expeditions for nine years, worked briefly as a professional chef, and am now working as an Academic Advisor here at UNC Asheville. My point being, the major you choose does not necessarily mean choosing a career. All of that being true, choosing a major is still a very important decision as it will impact many parts of your life. If this feels big and you are struggling with choosing a major, fear not! There are many steps you can take to help yourself and ease the decision. First, consider yourself. Honestly examine your past experiences and areas of interest. Do you think you want to be a veterinarian, but hate science classes and have never volunteered at an animal shelter or rehabilitation center? If this sounds familiar, perhaps you only like the idea of being a vet. However, maybe you excelled in your writing and composition classes, and have worked as a summer camp counselor since you were 16… you might consider a degree in English with a teacher licensure. It is also important to assess your academic strengths and weaknesses. Your major will dictate many the courses you take while in college. So if you truly hate math, picking a major that requires lots of math classes will most likely have a negative effect on your college experience, motivation, and grades. Remember to think not only about the end goal, but what will be required of you to get there. While you may not love every class you take, you should feel interested in and challenged by most of the classes in your major. Also, reflect on your personal preferences – are you an introvert or do you love public speaking? What are your values? Becoming a doctor takes many years of schooling- is this something you are willing to do? Do you have the grit for it? Secondly, study the logistics. Remember to pay attention to your credit hours, timeline, and financials. Some degrees require more credit hours than others. This could affect how long you have left in school, scholarships or financial aid, fees associated with hours limits, etc. With all of these things to take into account, here is my best piece of advice: talk with a professional! The Career Center and One Stop advisors are free services for you right here on campus. The advisors in these offices can (and are happy to) help you with this choice. We can help you assess your strengths, weaknesses, and interests. We can talk with you about the requirements for majors you are looking at and help you figure out how they will affect your time at UNCA. The Career Center is a great resource for students – don’t let the name trick you, it is not just about jobs. They can provide you with some self-assessment tools to help determine what you might be interested in. They can introduce you to people working in areas you are considering. They can help you find internships, assistantships, or jobs. Spending time working/interning/volunteering in your interest area can be a great help if you are unsure if it is your passion. Or, if you are more of a DIY type, they can direct you to some great online resources where you can research different majors and their associated job options, earning potential, popularity, etc. The advisors in the OneStop office can help with the logistics once you are ready to declare a major. They can talk you through requirements and timelines in any degree. They can help you bounce around ideas if you want to double major, do an internship for credit, etc. They can also help you determine if your financial aid or scholarships will be affected. I will leave you with this- thirty minutes of Post-Malone videos on Instagram might be time well spent, but also consider that same thirty minutes spent chatting with an advisor could change your entire college experience for the better. The choice is yours. Either way, you know where to find us. As a student at UNCA I am here to learn and further my education to get the career I want to have. I have found out that your search for a career should start long before you graduate. Knowing people and having connections can get you places you wouldn’t imagine. Speaking with your professors and faculty is a great way to start networking. Making sure you participate, ask questions, talk to them during office hours, and going to your department meet and greets lets them get to know you. Professors are here because they want to help us find a career and go down the right path, if they know you well they might even think of you when they hear of a job. I have even been recommended by professors to connect on LinkedIn with them and other people you know, their network can be a benefit to you once you connect! The Career Center is awesome with encouraging networking and providing opportunities for it. NextFest, Internship Expo, and weekly Employer Spotlights are amazing for talking to employers and grad schools directly. When you network and talk with them you make it possible for them to connect a face and conversation with a name if it comes across their table later. Talking to anyone at these events could lead to your next career opportunity, even if they do not seem like the type of job you are looking for. These employers at the events are here to talk to students and want to help and it can’t hurt to talk to them. Networking is a really great opportunity to get to know people, their paths to careers, any advice they have for you, and more networks. After a reluctant start, I have become a great networker. But, I still don’t walk into rooms full of people I don’t know and strike up conversation at random. How can both of these things be true? Because, while networking can involve being great at small talk, it doesn’t have to. For me, and other introverts like me, great networking is about relationship building. Instead of focusing on meeting a large number of people, I prefer to meet and get to know people one at a time. When I’m preparing to meet someone new, I read their LinkedIn profile and prepare a number of curious questions I have based on what I know about them. I stick with open ended questions so that I can encourage the person I’m meeting to share more. Through these conversations, I’ve gotten to know people across industries and learned about so many different career fields. This sounds way better than walking into a room and striking up conversation at random, right? So, how do you do this at an event like NextFest? A room full of 100 organizations just waiting for you to walk up and make small talk? You skip the small talk. And, you walk in with intention. Be prepared to mention a few things about yourself: name, major, year in school, experience, and what you may be interested in exploring. Walk up to the table of choice, introduce yourself, then ask your questions. If you like what you hear, ask for a business card, and then follow up after NextFest. It really is as simple as that! The people staffing the booths are here to talk with you, and they do this on a regular basis, so they are ready and willing to take the conversation and run with it! You’ll leave with information, and, the confidence that you CAN become a great networker, no matter how reluctant your start. How to Dress for your Interview! You’ve just been invited to interview! You’ve identified your strengths, you have excellent stories that highlight your skills and experiences as they relate to the position, and you’ve fully researched the organization. BUT you look at your closet and panic– what to wear?! What if they respond with: business casual OR business professional OR snappy casual? So many different interpretations! The most important thing to remember is that it’s okay to be a little overdressed. Overdressing shows that you respect the opportunity/event. Put on something that feels comfortable, that you know is appropriate through researching and talking with others, that shows you respect the opportunity, and then focus on what you want to say, because it’s more important to be remembered for your content than your style! Did you know that your Career Center has dedicated staff who works specifically with employers who want to recruit you? Hi, I’m David Earnhardt, and I’m the Associate Director for Employer Relations in the Career Center here at UNC Asheville. Every day I talk with employers, internship sites, service year opportunities, and volunteer organizations; and each one is interested in learning more about you! These folks are actively looking for students/alumni who are critical thinkers. Folks who can work with other people. Employees who are motivated to make an impact on their organizations…and every day I get the chance to share stories about the great work our students do both inside the classroom and in the community that helps build those skills… it’s a great job! I also meet with students and talk with them about what their goals are and how we can best connect with organizations of best fit in the community. This gives me the opportunity to help students network with professionals, get introductions, and find out #What’sNEXT. So how can you make sure you’re making the most of this semester? Start with a conversation with a professional in the Career Center. They can help you identify what you’re passionate about, how to align that with your goals, and can offer guidance on your professional documents to make sure you’re putting your best foot forward. Employers tell me all the time that they can tell who’s come through the Career Center, and who hasn’t. 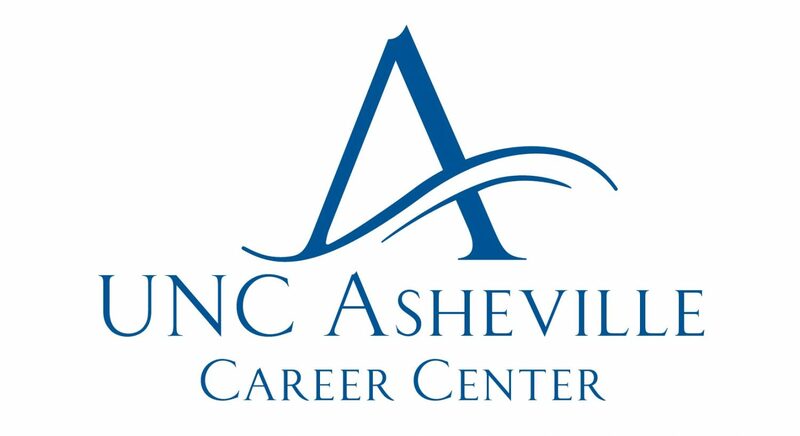 It’s tempting to put off thinking about your time after UNC Asheville, and delay working with the Career Center until after you’ve completed your senior year. I’ve seen that temptation lead to stress and anxiety that’s completely avoidable! Some small time investments now will pay big dividends when you graduate…so come on in, the Career Center’s a great place to be!